Our 100% recycled cardboard coffins are the perfect solution for families looking for a greener funeral option. 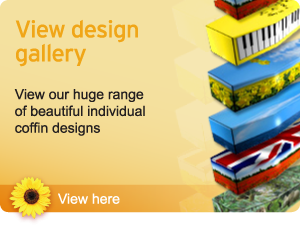 Available in a wide range of colour options, ranging from plain brown or white through to stunning multi-coloured patterns or pictures, all designs are printed and applied to the coffin on a biodegradable material wrap. Ultra-strong thanks to their honeycomb-style Beeboard® construction, these picture coffins combine high quality with unique and beautiful style. All Cardboard Coffins come with the genuine Colourful Coffins® daisy stud on the foot end.